Journeys are about exploring and discovering. They are crammed with surprises: interesting people, fascinating stories and intriguing places. Instead of racing to your destination, consider slowing down and spicing up your trip with some colourful stops. 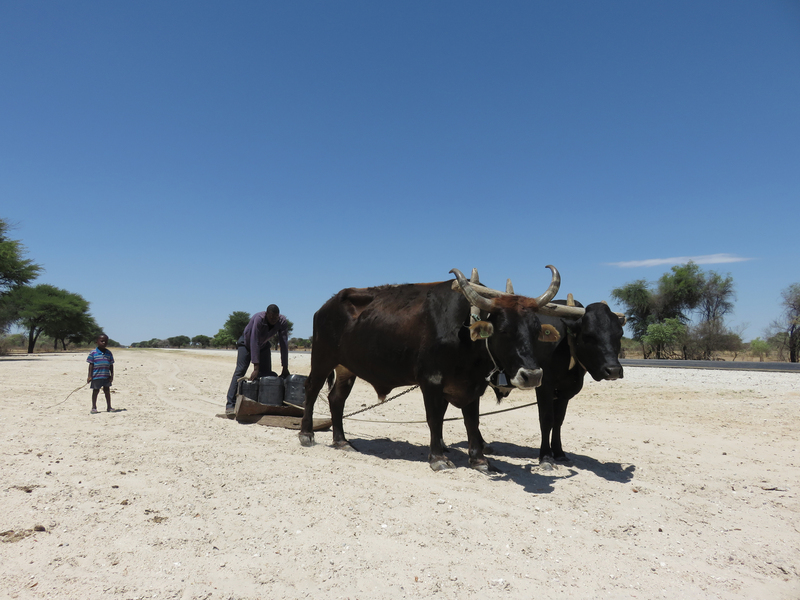 An ox-plough by the roadside, a rudimentary but still effective way of working the land. T he road north is an exciting one, as you take a leap into a more rural Africa and travel into the water-rich areas of north-eastern Namibia. At 700 km this route is a longish one, but with ample stops to stretch limbs – and the imagination, and to discover, explore, shop and break for meals – it’s an enjoyable journey. Best to leave early. First stop after Windhoek, and after crossing the Swakop and Okahandja rivers, is Okahandja, a convenient place to fill up on fuel and take a stroll through the woodcarving market. This is also a good spot to purchase a supply of biltong for the road and down a cup of strong coffee from Brewed Awakenings to set you up for the day ahead. that root on the verges, especially after the first rain showers. Prominent and unmistakable landmarks along the way are the Omatakos, a pair of buxom mountain beauties, so named after their resemblance to a woman’s fleshy behind. If time allows and earth history boggles your brain, make a turn onto the D2404 for the 64 km drive to the Otjihaenamaparero Guest Farm to walk in the footsteps of dinosaurs. The tracks, etched into the Etjo sandstone, are said to be 219 million years old. Human beings were but a dream on the wisp of the wind. Waterberg, ‘Water Mountain’, provides a good overnight stop for those on the slow road. The turnoff to the red-coloured mountain with its eroded sandstone crown beckons before Otjiwarongo. Waterberg is the historic site of the 1904 Battle of Ohamakari between the German colonial forces and the Herero. Soak up the natural beauty of several lodges and campsites in the area. 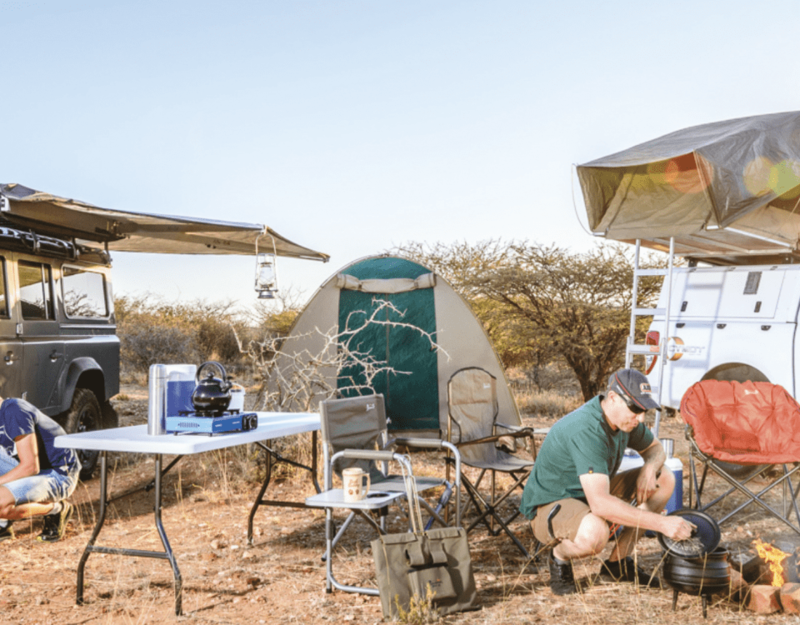 In the Namibian scheme of things Otjiwarongo is a large town and the perfect place to stock up, refuel and have a cup of coffee, brunch or lunch (Kameldorn Garten in Bahnhof Street is a firm favourite) before the next stretch to Otavi. From here, there are several options if you’re a history-lover – or a traveller interested in juicy bits of information from Namibia’s past. 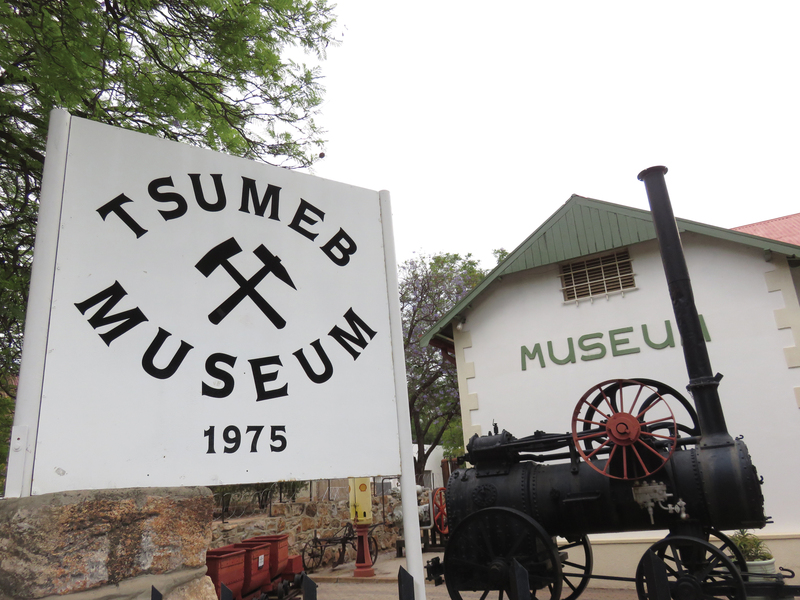 Tsumeb and Grootfontein both have small museums which are worth a visit, so if time allows, add a short loop to the journey and head towards Tsumeb. Relax at the Dros Restaurant at the Kupferquelle Resort, an easy stop at the entrance of the town to fill bellies before the generous serving of history. however, but the chunky century-old field-cannons and machine-guns polished to a shine, which fill the sprawling room. On closer inspection it becomes apparent that these are the weapons that were sunk by the retreating Germans in the nearby sinkhole, Lake Otjikoto, lest they fall into enemy hands. They were retrieved from the lake in the early 80s. 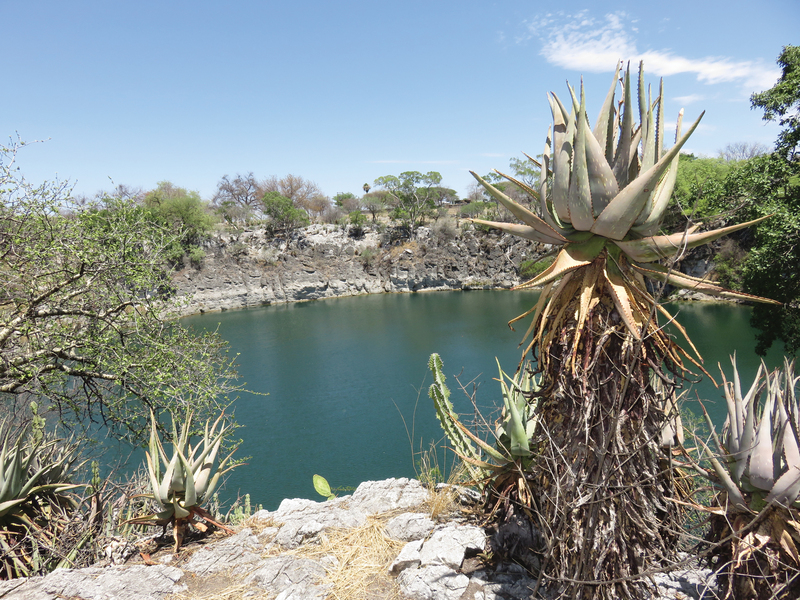 Lake Otjikoto is an 18 km drive on the B1 from Tsumeb, and as it is situated close to the road, is an easy detour to include if the history bug has bitten. Along the road from Tsumeb to Grootfontein keep your eyes open for signs to the D2859 and the Hoba Meteorite. A 20 km drive along the gravel takes you to this auspicious site where the largest known meteorite to be found on Earth fell through the atmosphere some 80 000 years ago – and presumably landed with a tremendous clunk and a dust cloud to rival all ill-famed manmade explosions. Climb aboard this 60-ton chunk of iron – or ‘shooting star’, discovered by chance in 1920 by a farmer tilling his fields, and remember to duck when you approach the ‘Beware of falling meteorites’ sign! 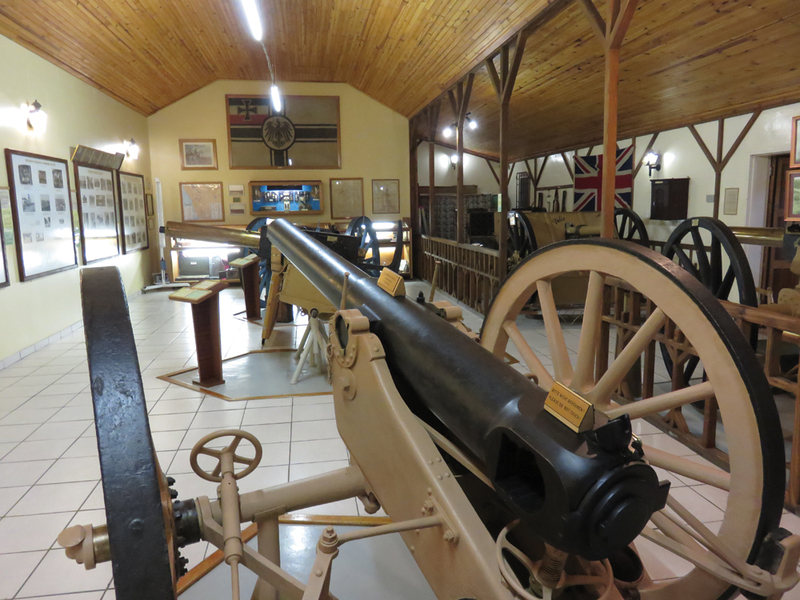 Housed in the old Schutztruppe fort, Grootfontein’s museum stands out for its charm. The crumbling old fort was repaired in 1977 with funds raised by a group of businessmen and has operated as a private museum ever since. Picnic tables outside provide shady spots to nibble on supplies or to take a breather, and indoors offers a collection of interesting items and snippets of information. This includes an old letter about the Hoba-meteorite find; a copy of Hartmann’s original map – one of the first reliable maps of the country; correspondence between famous Herero chief Maharero and Hartmann; an assortment of clothes from the intrepid Dorsland trekkers who travelled through the Kalahari into Angola in the late 1800s; and of course, the history of the construction of the longest narrow gauge light railway in the world at the time, the Otavibahn, completed between Swakopmund and Tsumeb in 1906 – and between Otavi and Grootfontein in 1908. But the Kavango lies ahead, so take your leave and continue northwards. North of Grootfontein is the turnoff to Tsumkwe and the Ju/’Hoansi-San Living Museum run by the San/Bushmen of the Grashoek village. A visit to the living museum is recommended to experience the traditional life of the San, if you have the time (it’s a 74 km drive on gravel) and a 4×4 vehicle to negotiate the soft sand. Alternatively, you can arrange a shuttle with Roy’s Camp, a few kilometres further on. Roy’s runs trips to the living museum for groups of 7, booking is essential. But, wait for it! The journey is about to change – dramatically! As you drive through the Mururani Veterinary Gate, 50 km further north, farmland transforms into rural Africa. Welcome to the Kavango Region! It’s a step into the past with wattle and daub huts and ox-drawn carts – and a wonderful passageway into the heart of Africa. Slow down for people and animals. The well-made carvings, pots and cone-shaped woven fishing nets, characteristic of this region, are sold along the roadside, as are monkey-oranges. Make a stop to buy and try this delicious and unusual tropical-tasting fruit. 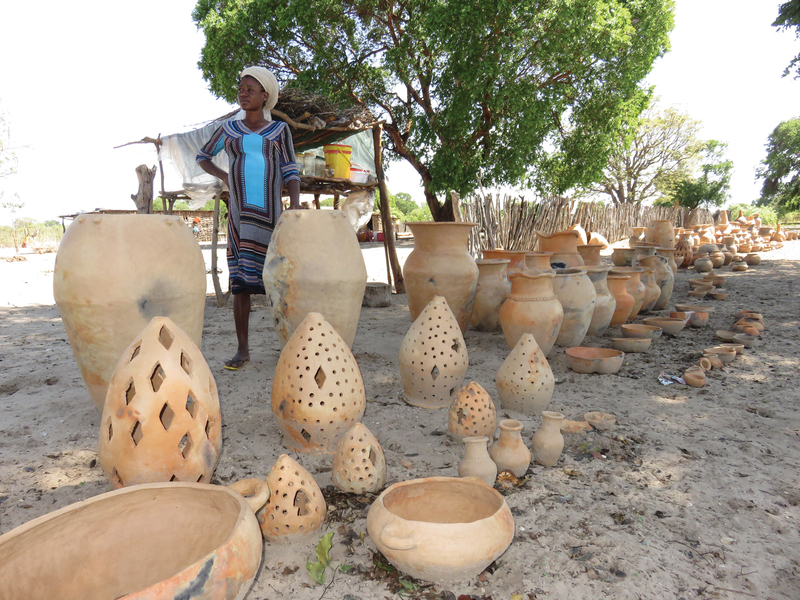 Don’t miss the Ncumcara Community Forestry Craft Shop on the left-hand side 30 km before Rundu. This is where permits are issued for trees to be harvested from the community forest and a small shop serves as an outlet for the carvings. The place is filled with well-made Kiaat bowls, spoons, animals and fold-out tables. Decorative wooden doors, chiselled with an African design, are the speciality of the carpenter-manager, Joseph Lihita Njamba. 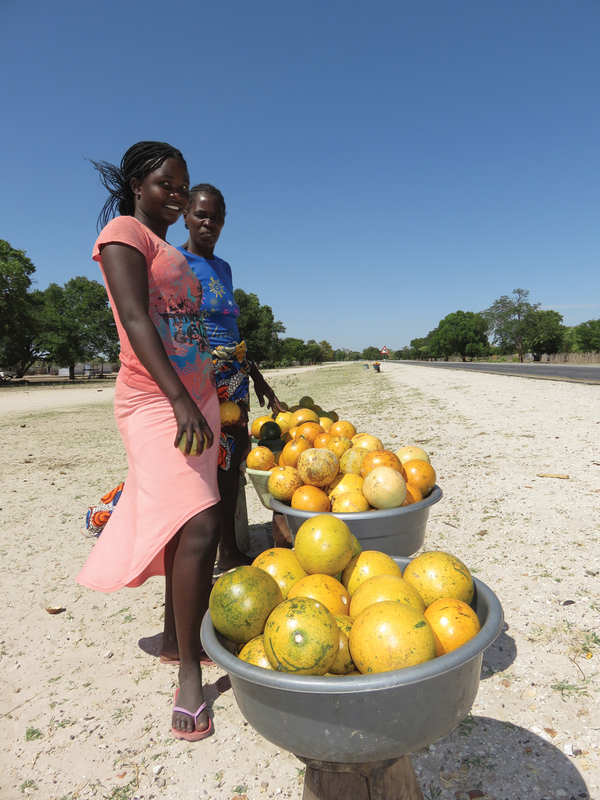 Soon after Ncumcara, a motley assortment of corrugated iron houses and shebeens line the road as you near Rundu, your destination on the Okavango River, where water bird calls and river peace await you – and an evening of lush, golden beauty. The promise of the morning and the journey into the Zambezi Region are still a night’s sleep way. So, there’s time for a sunset boat cruise, a wholesome meal and a sound sleep to the chorus of frogs. This article was first published in the Travel News Namibia Autumn 2017 issue. rundu is the second town of namibia?